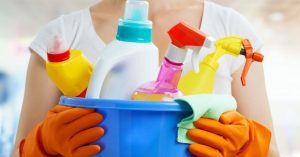 You have the basics down: doing laundry, keeping the bathroom clean, wiping the kitchen countertops — but dirt and grime have a bad habit of collecting in the strangest places. Here are some spots around your house you should consider cleaning more often, if you clean them at all, because they’re probably pretty dirty. They may accumulate bacteria as well, but there’s no reason to be a germaphobe about them. This should help your family stay well this cold/flu season. Your smartphone – For something we use for hours every day, when’s the last time you did more than just wipe off your smartphone’s screen when it was too smudged to see through? In reality, considering how often we use our phones, and where we use them (yes, that includes checking Facebook in the bathroom), our phones deserve a more thorough cleaning from time to time. Your computer keyboard – When you’re not using your phone, you’re probably using a computer, which means your fingers are constantly in contact with your keyboard. And considering many of us snack or drink over our computers, you can imagine the grimy world living just below those keys. Your remote control – Be honest; have you ever cleaned your remote control? Have you even so much as wiped the grime and dirt from the valleys between the buttons? Not only will it keep things less germy it will prolong the life of your remote. Your pillows – You may not know it, but most pillows are designed to be machine washable. And it’s a good thing too, considering pillows tend to be exactly where dead skin, dust, drool and in many cases, dust mites love to hang out. For most people, that’s not a huge deal but for people with compromised immune systems or who have allergies, they can be an irritant that makes for sleepless nights, skin irritation and sinus congestion. Isolate toothbrushes – Once a household member is ill, it’s best to separate their toothbrush from the rest of the pack to avoid germ contamination. After the person gets well, replace the toothbrush or toothbrush head with a new one. Consider disposables – Paper towels and paper cups can be your friends when germs are an issue. Give the sick person a roll of paper towels to use when washing hands in the bathroom, instead of using a communal towel. There is usually a lot of water drinking and pill-taking, so instead of having to wash glasses in hot water, switch to paper for the duration of the illness. The staff at Shingletown Medical Center is proud to provide first-rate care for you and your family.